The assembled Media mob down by the Rays dugout before this game merited a quick look. You usually do not see this many assembled media talking heads without reason. Then I saw the trademark sweater, the smile that radiates towards the Trop roof and immediately knew Rays principal owner Stuart Sternberg was holding court with the media minions. 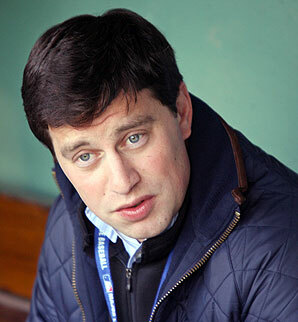 On tap this day was a bucketful of concerns within the Press Box about subjects like the possibilities of Rays Vice President of Baseball Operations heading to his Houston hometown to head up the new Astros future. Also on the minds of the media was if the Rays would be “buyers or sellers” before the Trade Deadline at the end of the month. Sternberg just showed his pearly whites, tap-danced a bit for the assembled crowd and really again made the masses fall in love with him all over again. That is the mark of a great salesman. Using his charm, personality and a bevy of great information and background materials, Sternberg tames the Media beasts once again. Sure he might not have stabbed an issue in the heart like the attendance concerns or about Friedman, but he also did not skirt the issues at all. Some of the things that came out of Sternberg’s mouth did follow the Rays “ party lines” and did not surprise me in the least. But others comments did pose a slight concern, not in their rhetoric or presentation, but what was not said by Sternberg. Still it is always refreshing to get the words straight from the “horse’s mouth”. Sternberg was asked about items like the Rays downward trend in attendance figures, if the Rays have the fiscal resources to “upgrade” their team before the Non-Waiver Trade Deadline. His comments on the Rays struggling attendance was refreshing since one local media source seems to want to force-feed the public the attendance figures every night. Sternberg’s statement actually instilled a bit more confidence in me that the Rays owners is really here for the long haul, not a possibility of selling the team and moving onto more fiscally “greener pastures”. Refreshing to hear an owner talk straight from the hip and not sugarcoat, project pessimistic intentions or evoke a sense of entitlement that fans flock to his stadium. Sternberg has always remembered that this town is a tourist-based locale, and with that comes fluctuation in the fan base, community monetary flows. There is a presence of support, a foundation to build on that is solid, plus his focal group, the youngsters growing the Rays tradition are maturing. This comment by Sternberg might seem more versed in risk management assessments and terms than baseball, but you get the jest completely. 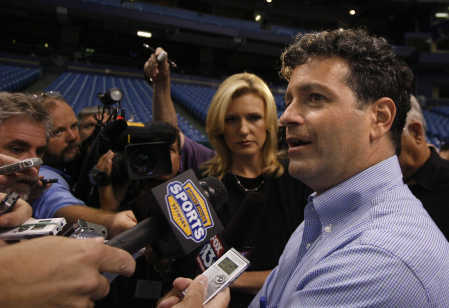 The Rays are focused on getting a good return on any investment, trade or salary dump. With high profile Rays players like B J Upton, James Shields and possibly even Andy Sonnanstine on several M L B team’s radar, the return has to justify the decision. 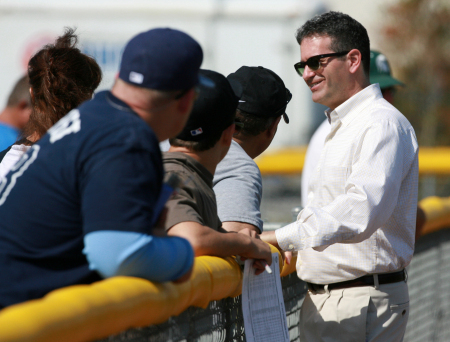 Here is where Sternberg and his henchmen Rays President Matt Silverman and Friedman have excelled in recent seasons. They understand the power of the trade, and use it to their advantage. You only have to look at the trade of Rays starter Matt Garza before the Spring of 2011 to see the team is committed to getting a return that develops into a positive flow. In that transaction the Rays got their “legend” Sam Fuld, outfielder Brandon Guyer and a future starting shortstop who has seen his stock as a top prospect rise repeatedly this season towards a Top 10 spot. Interesting enough, one of the players the Rays trade to the Cubs, outfield speedster Fernando Perez has already been cut from the Cubs system. Touch e` Stu. Spoken like a man, a confident business owner and beyond all of that a honest baseball fan. 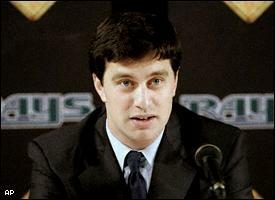 We are lucky to have someone like this pulling the reins on this organization. Sure he wants to make a profit, show a positive gain both in resources and even fan commitment, but he also know the product will sell itself. Baseball fans around the country know the Tampa Bay franchise is a hidden gem with boatloads of potential and possible moments. Sternberg is the man at the top of the heap, the guy who ultimately decides the direction of this franchise…He is the perfect person to help guide this currently turbulent Rays ship through the shallow Tampa Bay shoals and sandbars unharmed before emerging into the crystal blue waters where smooth sailing will be par for the course. Oh Captain, my Captain. Some around the Rays Republic have already thrown up their hands in disbelief and bewilderment at the current state of the Rays roster without thinking of the overall picture or possible scenarios that could hinge based on this one trade recently of Tampa Bay Rays starter Matt Garza, outfielder Fernando Perez and minor league prospect Zack Rosscup. Individually they all might not seem related, but as a whole they turn into a gold mine of future potential and possible long term roster additions for the future of this Rays franchise. 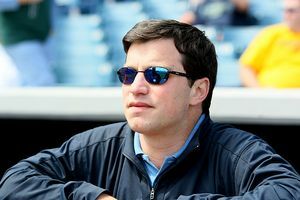 No one has even minutely dug into the possible second vein of gold that is awaiting the Rays when the 2011 MLB First Year Players Draft is held and the Rays hold key positions in a relatively deep draft. The team could eventually through this Summer’s draft picks, plus the key addition of several top Cubs prospects could be in position to be sitting pretty both in personnel and fiscal contracts well into their next purge into playoff contention. And do not forget just because of the mass exodus of some from the Rays fold, do not under estimate the power of a well turned draft and a few cunningly calculated trade pieces that could sparkle bright for many years with the right moves. For some odd reason, every time the Rays have made such a trade move since Rays Vice President of Baseball Operations has been given the keys to drive the Rays team bus, I always seem to visualize Friedman putting together one of those intricate 500-1,000 piece photo-based puzzles. That has become the basic nuance of Rays trades in recent years that the team has to find some sort of innate value over the long haul of the deal for it to get past just the chatter stage. Friedman has become a bit of a puppet master over his last few deals in wheeling and dealing until he gets just the right mesh of talent and potential that will satisfy his fiscal and physical demands. In this trade, the upside seems to favor the Cubs, but under the surface, the Rays might have struck a hidden vein of golden future potentials. The Rays acquired the Cubs top pitching prospect (Christopher Archer),their top catching prospect who was thought to be in the mix for a possible Cubs back-up spot (Robinson Chirinos), two outfielders ( Sam Fuld and Brandon Guyer), plus a possible future Rays shortstop option ( Hak-Ju Lee). 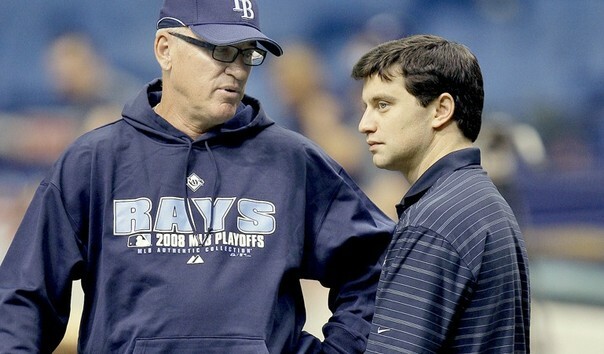 If you look at 3 years down the road, then the Rays definitely got the better end of the deal. But it is a two-way conversation, and based on potential now and of value to the Cubs chances of regaining a post season nod, then the Garza trade favors the present day Cubs, but might hurt them in their farm system in the long run. And this might trouble some within the Rays Republic who can not look beyond the puzzle’s photo and into the intricate jigsaw pieces and future combinations that could turn into another chance for the Rays to contend. Intricate pieces of this trade puzzle come in the form of RHP Archer who could possibly be sent to Double-A Montgomery to start the year, then with a great start and a maturation process, could be another potential Rays rotation piece knocking at the door by 2012. Archer’s has a tremendous slider and has huge potential upside for the Rays farm system staffs as he rises through the Rays system. 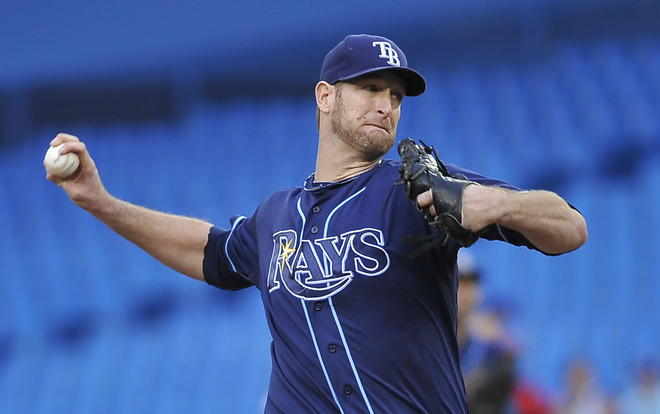 Having another well-tooled pitching weapon in the Rays system is never a bad thing. The addition of the infielder turned catcher Chirinos to the Rays catching corps could make current Rays catcher Kelly Shoppach into trade bait this July with an impressive minor league season. He will join an a Rays farm system catching corps that is quickly becoming a firm asset of the Rays system. If Chirinos hits his marked potential during this minor league season, the Rays could see an extremely young catching duo of John Jaso and Chirinos as early as August 2011. Possibly earlier if an injury besets Shoppach. I still feel firmly that the addition of 20-year old infield prospect Lee to the mix just gives the Rays another option of SS prospect Tim Beckham doesn’t begin to develop as the next Rays SS prospect. Bringing Lee in might just jump start Beckham’s competitive juices and finally get him to retain his First Round Pick potential. If not, the young Lee, who was considered the Cub’s fourth best prospect could be the steal of the deal. The last hidden piece of this trade puzzle might be Guyer who could start the year at Triple-A, but after being selected as the Cub minor league player of the Year in 2010 with a .344 average with 13 Home Runs, 58 RBIs, 30 stolen bases and a .588 OPS. 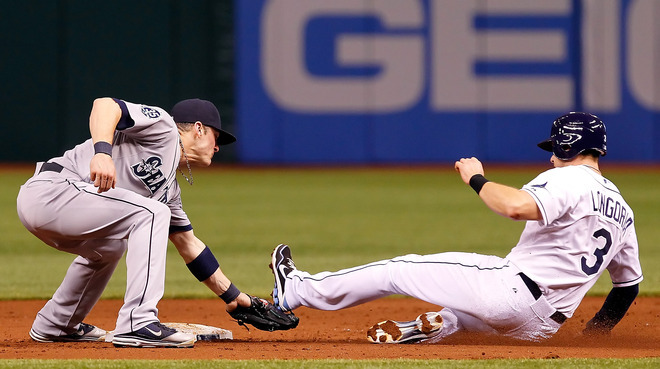 Over his first 4 years of professional ball, Guyer has a .292 average with 92 steals. Instantly you think this might be the guy the Rays wanted in the deal as a future player to replace a certain current Centerfielder who’s game has not lived up to the hype recently. A quick comparison shows that B J Upton had a .234 batting average with 18 HRs, 62 RBIs, 42 stolen bases and a .322 OPS. A quick gander shows that if Upton gets into a sudden hitting funk, or doesn’t live up to a $ 5 million dollar salary, we could also see a exit visa punched for Upton to possibly finish 2011 in another team’s colors. The Sam Fuld/ Fernando Perez swap just looks like a solid wash with the Cubs getting a speedy option as a outfielder or pinchrunner and the Rays getting some potential outfield depth in Durham or on the Rays bench. This is a minor deal churning within the bigger idea, but both will compliment thier new teams this Spring. Suddenly if you look at each piece of this Cubs/Rays puzzle, it all adds up to a huge potential for change as early as the 2010 Trade Deadline. I bet even as I am sitting here pecking at these keys Friedman is sitting possibly online right now watching video or processing data looking for the next great Rays trade. Or maybe Friedman is just sitting at home right now sitting at the dining table staring at a pile of 500-1,000 individual puzzle pieces spread out in front of him trying to assemble a 3-D feasible puzzle of how to visually get the Rays back into contention. 500-1,000 individually crafted pieces that could systematically transform into another postseason puzzle with just the right combination of pieces. Or did he just acquire those pieces? The Tampa Bay Rays have begun their yearly ritual of slicing off some of the players today who might not make their 25-man roster to give players a chance to either get a chance with another team before the beginning of the 2010 MLB season, or hitch a ride in the Rays minor league carousel. Most of the names did not surprise me, or even have a legitimate chance to make the Rays roster, but there is one name I thought might get a longer tenure in the Major League camp. Justin Ruggiano has always been a great player for the Rays each time they have decided to bring him up either short-term because of injuries, or during their Spring Training camps before finally sending him to their Triple-A affiliate as a right-handed insurance policy. Considering he was hitting .447 with 11 RBIs this Spring, I really hoped the Rays would consider him longer on the Spring roster with the question marks still over the heads of outfielders Matt Joyce, and another unimpressive Spring from fellow right-hander Gabe Kapler. And a few of us long time Rays Republic members might remember some of Ruggiano’s past events while at the Major League level and wonder what, besides a logjam at outfielders, is keeping this guy down on the farm. 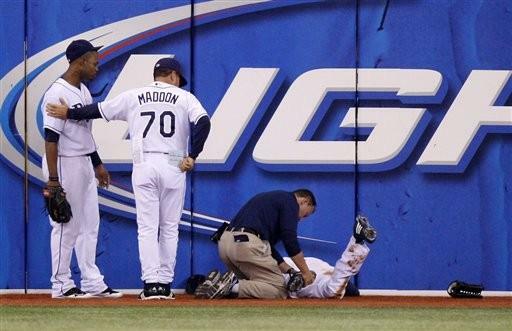 Sure he let a ball fall in front of him during a game that cost the Rays a run, but he also did a full face-plant into the Leftfield padding catching a screaming line drive in 2008. And I have heard more than a few people say does he have the stats to be a Major League everyday player, but then I point people to Kapler’s same decline in stats and get the reply that “Kapler has paid his dues”. And I hate that cliché’ when people throw that out at you. If you do not get a chance to build a foundation, how do you pay your “dues”? Sure Ruggiano got his first taste at this level in 2007 when he came up and appeared in 7 games in 2007 and went 3-14, but he did make enough of a impression that he lasted long into the 2008 Spring Training season with the Major League camp roster even with a dismal .176 Batting Average . But I seriously thought the Rays organization might take a long and hard look at Ruggiano this year and find a way to keep him up here with the question marks I think are still lingering in Rightfield. Sure we have one portion of the platoon system firmly implanted in capable glove of Ben Zobrist, but still there is the inability of Kapler to give us that one firm reason to keep him besides a great mentoring process and clubhouse presence. And sure both of those qualities are monumental to helping build and maintaining team character, but with Kapler batting .136 this Spring…The Rays do have a viable option to Kapler in house right now. But I also see the influx of the Rays farm system about to gobble up Ruggiano as more players get that chance to position themselves also for a shot with the big club. And here was a guy who was up with the Rays Spring team leaders in games played to this point who now will move his belongs over to the minor league clubhouse and begin his Triple-A 2010 experience. And how many Rays fans know he was the Durham Bulls Player of the Year in 2007 while hitting .309 with 20 HR 73 RBI and 26 stolen bases. But then again, Ruggiano has always been a bit of a unknown except to some of us who watch Rays Spring and late season baseball. 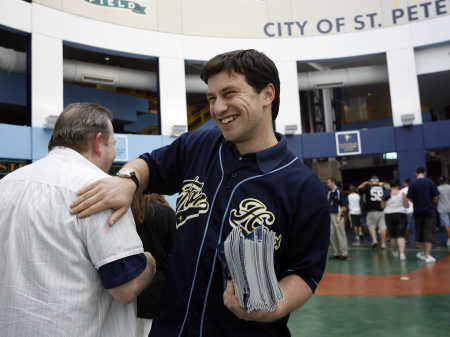 Who also remembers that he was the player-to-be-named-later from the Los Angeles Dodgers in the June 26,2006 trade that sent pitcher Mark Hendrickson and catcher Toby Hall and netted the Rays Dioner Navarro and pitcher Jae Seo along with Ruggiano. He is widely popular in Durham as he does play the “Rays Way” both on and off the field and is a fan favorite up at Durham Athletic Park. But with his surge this Spring taking over the minor league player to watch role that former Rays minor league outfielder Jon Weber held onto for several Spring, I thought he might have finally broken through and showed the Rays they can take a chance on him. But instead, the Rays purged him from their Major League camp and he must rejoin his Durham Bulls Triple-A Champion teammates to begin the 2010 season. And time is really clicking away for Ruggiano to show his stuff at the Major League level, and it has nothing to do with ability. 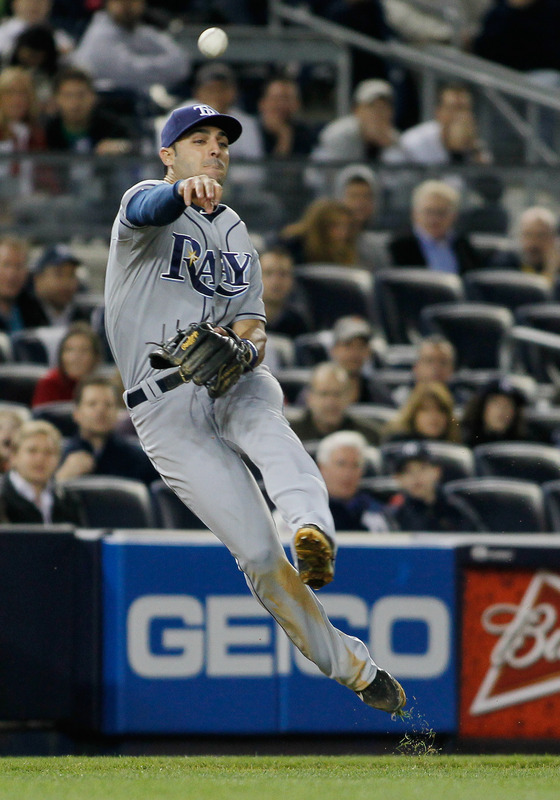 But maybe his 2008 Rays campaign left doubt into his abilities to suffice at this level. A .197 Batting Average over 45 games of spot duty can bring up many dark clouds as to your abilities, and future projections. 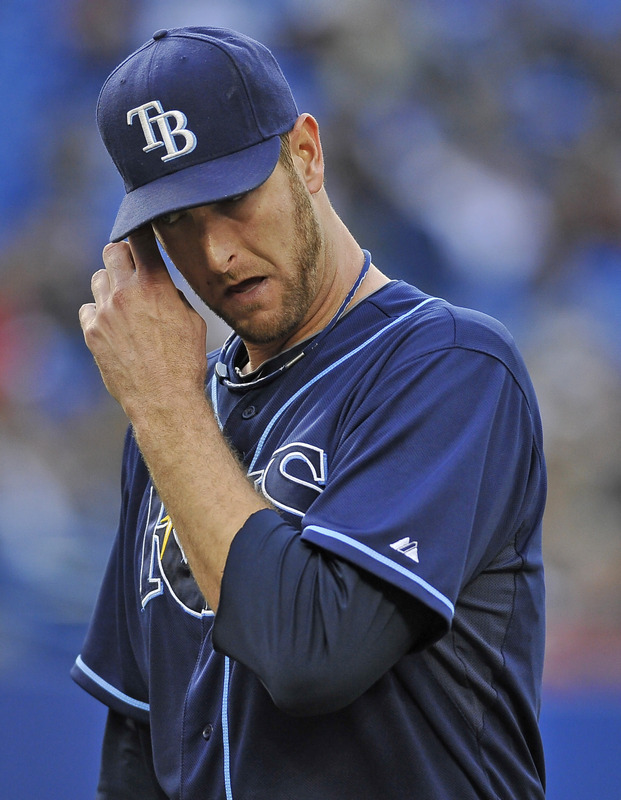 With the Rays logjam at the minor league level with players developing who can play any of the outfield positions in Tropicana Field, this might be his last season to make an impact and show to the Rays or other teams he can succeed at this level, like Kapler for a long time. Right now players like Fernando Perez and even Desmond Jennings are getting the headlines and interviews instead of Ruggiano. Because of the hype concerning Jennings and the on and off again injury situations concerning Perez, the spotlight has always been a bit dim on Ruggiano. 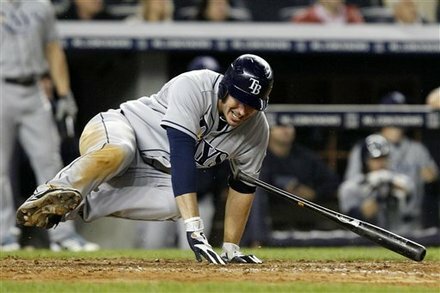 But he is ready and able to perform, sweat and even bleed if necessary to help this Rays team in 2010. It is a shame we do not see a possibility of extracting Kapler and inserting Ruggiano into the right-handed portion of the Rightfield mix. He has the base stealing ability and the glove work to exceed Kapler, and could certainly hit better than Kapler’s 2009 .239 average with 8 HR,32 RBI and 5 steals. But then again, maybe his MLB past has haunted him, but then again how can he dispel those darkening clouds when Ruggiano is not given a chance to show his own Rays of light can also shine bright. What the heck Joe! Now you know I respect you a helluva lot, but I am probably not the only one within the Rays Republic today scratching my forehead wondering why you made the move you did yesterday against the New York Yankees in a Spring Training game it seems your team was dominating in at the time. Why would you even think of pulling Sean Rodriguez who was about to put up a possible career achievement like hitting for the cycle and pinch-hit him for Fernando Perez? I am wondering why you did not let Rodriguez at least get a fighting chance at completing his drive for the cycle and pop Perez into the outfield in the bottom of the inning. I mean the guy was about to do something as complex as hitting for the cycle in reverse. In reverse Joe! You watched him in his third game this Spring during his first at bat hit another ball deep enough to go out of the ball park (with some help from the outfield padding) against the Yankees to give your team an early lead. I would be excited just by that feat in itself, but the kid out did even my expectations by then hitting a triple, then getting another RBI double to post 5 RBI on the day, which was the more than enough to help you team post a 11-7 win in Tampa against your AL East nemesis. But still this is gnawing at my frontal lobe Joe, why you did not let the kid try for it. I know the Rays new mantra of W.I.N. or “What’s Important Now”, but to me yesterday, it was letting the kid have a chance to put a firm stamp on his competition this Spring by going above and beyond even your wildest expectations and securing a rare feat, even in the Spring, of a cycle. I am just perplexed here Mr. Maddon. I really do not know what to say mostly because I know the Spring Training season is the time to try new and unique situations or plays, but this one really has me so befuddled I almost couldn’t write this today. Here is a player basically about to come out of his cocoon stage and become a regular season butterfly for the Rays, and he gets sat down for a pitch-hitter right when he is about to secure what is considered an almost impossible feat. And I know I am not the only one to consider this situation, and I might read a bit more from local news accounts within the next day or two, but personally, I am a bit bewildered beyond belief. I guess my realization that it is the Spring has to be my mind’s justification for this happening because I know you were not snoozing during the game and knew the scenario that was playing out on the field. But hidden underneath all of this was the spike of emotion that somehow suddenly seemed to be lacking in your team until they finally rebounded in the top of the eight inning to secure this second win of the Spring for the Rays. I guess there is a lot more to managing that I can see from my seat here within the stands today. But I also see Rodriguez’s missed opportunity yesterday to have a “career” moment as a small blip on the oversight meter that you might have dropped the ball on this one. I am more upset with the idea that it could furnish a seed of doubt within a young player’s mind who is tearing this competition between himself and Reid Brignac to shreds, and maybe that is something the Rays brass do not want to see settled so early in this Spring battle. But then again, I am only a fan and not a member of your dugout crew and do not know if there was a secondary reason for this based on match-ups or even the slightest hint of a situational movement by you to pop Perez up there at that moment. So now that I have written my rave and gotten it out of my system, I hope if the same situation happens again in 2010 that we let the guy hit for the chance. Missing the opportunity might be just as bad as striking out in that pressure situation yesterday. Both can pop seeds of doubt or inconsistent decisions deep into their mindset that can blossom and turn this battle into a one-sided affair. But now in my moment of getting it all out, I am again resigned to believing you know what you are doing at all times in the dugout. 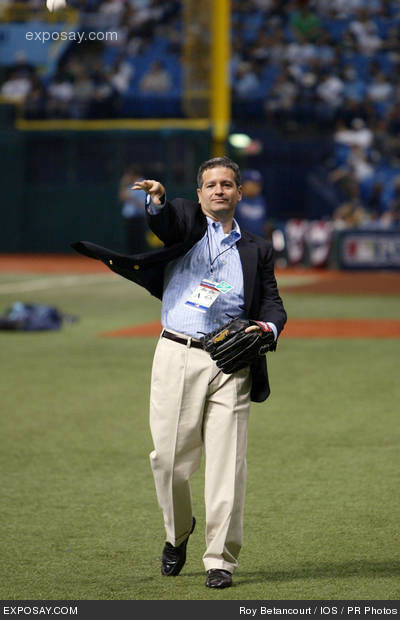 For I have a lot of respect and admiration for what you have done since you took the reins in 2007 to change to psyche and the foundation of Rays baseball through your theories, actions and game day quotes that have inspired, motivated and amused us while you have been at the helm. No Captain Joe, I am not calling for mutiny or even a vote of the crew as to that course of action with regards to Rodriguez and his shot at the cycle. There has to be a gem of wisdom in there somewhere, and even if I do not agree with your action, I will come to accept the move in time. Still, I wanted to see what Rodriguez would have done against the Yankee reliever. 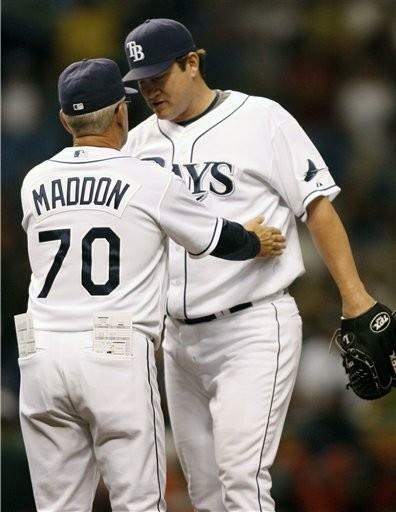 Who knows, maybe Rays Manager Joe Maddon made the right decision……maybe. 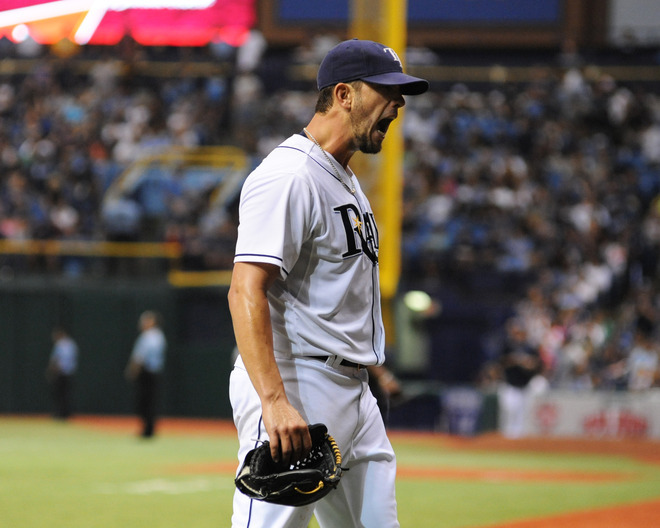 Last Sunday was the final Tampa Bay Rays game of the 2009 season. It is funny, but for some reason this years just seemed to fly by, and was over way to soon for some of us sitting in the stands. Not sure why it felt that way unless the extra time last season marching onto the World Series just made 2008 seem almost three months longer. But unfortunately, we are at that time where bags are packed and boxes are sent to other locations so members of the team can get some needed R&R before starting it all over again in 2010. And because of that extra time playing the game they love, some of the Rays had an abbreviated off season in 2009 because of other activities, such as participation in the World Baseball Classic, or several Rays players went to Winter Ball in 2008 and had only about 3 1/2 months to themselves and to individually train before they had to reporting to Port Charlotte, Florida for their first Spring Training away from St. Petersburg. So on that last day of the season, I decided to ask a few of the Rays if they had any special plans or goals for this off season. And I have to admit, that one of the “vacation” suggestions makes me hunger to maybe hide somewhere in their luggage, just pop a few air holes in the bag for me please! But there also seemed to be another angle coming up in a lot of their conversations. The talk of just total rest and relaxation without the stress or pressure of the white round ball. It seemed that so many of them just wanted to just “chill and relax” after the rush and the extent of the 2008 playoff season. And still others have a few life changing moments coming fast on the horizon and needed to make some last minute adjustments before getting on with their lives. Then there was a small group who might be facing that decision about their careers, and if they still want to don a uniform in 2010 for any team. A total of three members of the Rays Bullpen will be getting married this off season, two players and Scott Cursi, the Rays Bullpen catcher who will finally marry his sweetheart of five years in November 2009. It is funny, it is just like yesterday that I met Cursi and his bride-to-be, who used to work for the Rays and is now working in partnership with Rays Manager Joe Maddon’s wife, Jaye in a concierge service for people on the go, like the Rays players and their families. I pulled it out of Cursi that they are going to have their romantic and exotic honeymoon on St Lucie’s Island at the all inclusive Sandals resort, and both should come back with a beautiful Fall tan. But then we also have a former members of the Rays Bullpen crew going down the aisle soon in ex-Ray Jason Hammel, who will be getting married this off season in St. Petersburg, Florida in the striking Renaissance Vinoy resort right on the waters of Tampa Bay. Rays reliever Grant Balfour will be the first to be strolling down the aisle this off season, and the Aussie is not planning any additional triathlete competitions this off season, but is just going to enjoy the time off this year. 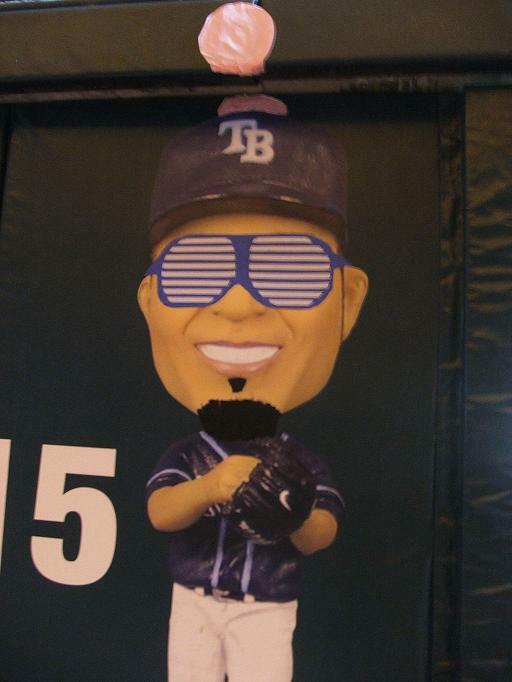 Rays closer Du Jour J P Howell will also be closing the deal with his bride-to-be also this Fall, and then plans to just be “The Dude” until it is time again to report to Spring Training camp. Congratulations to both guys and their brides, and I wish all of you all the luck in the world and a total boat of happiness as you begin your lives together. Neither of them would tell me where they plan to honeymoon, but that is okay, because one veteran member of the Rays Bullpen might have them beat totally just on the romance factor anyways. Rays reliever Dan Wheeler and his wife will be taking a beautiful European adventure to Italy, with stops in Rome, Florence and Venice on the agenda. Hopefully while he is on his Italian adventure, Wheeler might see the lone Rays cap that Rays Manager Joe Maddon saw in 2008 in an Italian train station. I have to say, this might be the one I want to see pictures of when he gets home (I wish!). Just the idea of getting out of the country like Cursi and Wheeler sounds like the perfect way to get some isolation and some peace to again get ready for another 6 months plus grind in 2010. And that is one of the great advantages of having a job that is not 9-5, for 12 months out of the year. Plans can be made, and special events planned without a hitch. Wish some days we could all live like that. But several members of the Rays roster will not have that luxury of world travel and no commitments. Some of the Rays are committed to going to play Winter ball in exotic locales. This additional work should show the Rays brass that they are vital pieces needed by the team, and also get some great prep and conditioning work before they report to Spring Training in February. Justin Ruggiano, who was at Durham Bulls for all of the 2009 season will be heading to Venezuela, while Shawn Riggans will be heading to Puerto Rico for Winter ball. Also scheduled to go to Winter ball, but he doesn’t know his location yet is outfielder Fernando Perez, who was out most of the season with a bum wrist. This actually might be a great thing for Perez to not only get some work in at the plate, but to get some flexibility in his wrist so he is not a question mark in the Spring. This upcoming season might be his time to shine, or he might find himself somewhere else soon manning the outfield for another team. There might be others from the Rays roster also going to Winter ball, but that list has not be released to the public yet. But then there are guys like reliever Randy Choate who participated in Winter ball last season and will just wants to sit back and relax this season. 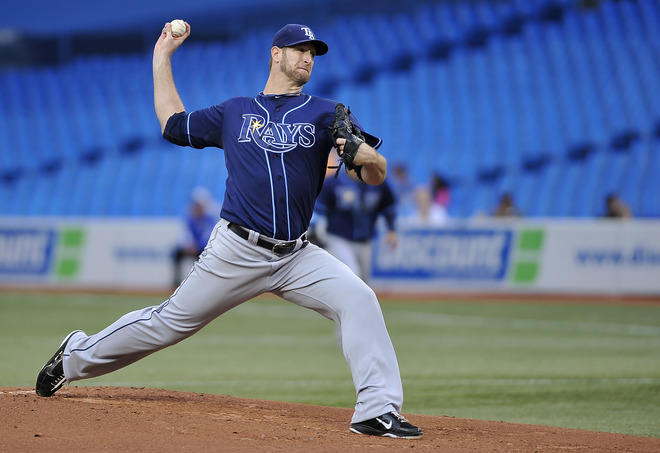 Jeff Bennett, who came to the Rays late in the season, is planning to remain in the Tampa Bay area for a while this off season to work on his conditioning before going back to Tennessee and working out and gaining more strength and endurance after his injury in 2009 while he was with the Atlanta Braves.. While Bennett might be sweating and working out, two members of the Rays might be hanging up their cleats for good this off season. Veteran Russ Springer has been playing baseball for a long time, and made his Major League debut back in 1992. Springer has been considering retiring this off season to spend more time with his family and to pursue some of his other interests in life. Springer is also looking forward with more time playing and enjoying his young son, who has autism and just be there to spend quality time with him. But you can bet that there will be more than one opportunity for him to put his coondog in the truck and maybe meet up with fellow Rays teammate Chad Bradford and go duck or deer hunting this off season. Both men value their country roots, and they both developed a great kinship this season around outdoor sports. You could see that this bond should hold firm as both men live in the off season back in the Alabama-Louisiana area. But Bradford, who is also considering retiring to spend more time with his newborn, and the rest of his family, might have a Hollywood role in his future. And his addition to the silver screen might be delayed right now due to some script re-writes, but because of his time with the Oakland Athletic earlier in his career, the role would be a new adventure for Bradford. There were rumors earlier in 2008 that when the movie “Moneyball” finally goes into full scale production, Bradford might be able to play himself in the movie. At that time it was not known if he would have the time during the season for such an adventure. It would be a great opportunity for Bradford, who reminds me of actor John Ashton, who played Sergeant Taggert in the “Beverly Hills Cop” trio to get some quality time on the silver screen. But Bullpen guys like Brain Shouse and Lance Cormier are just going to take it day-by-day and just enjoy the time to relax, spend time with family and to heal up before reporting again in February. 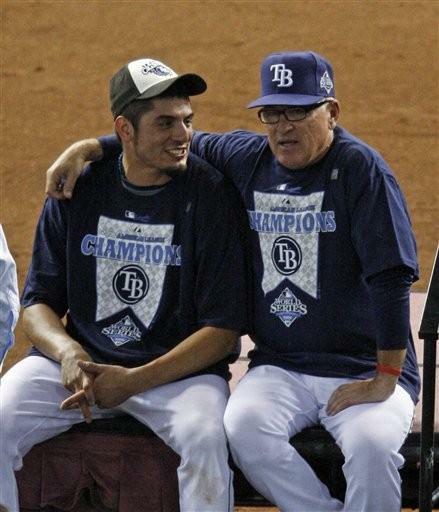 But there is one member of the Rays family group who might be going a hundred miles-an-hour during this off-season. Todd Kalas, who does the Rays television broadcast in various positions, will be working hard this off season involving himself with University of South Florida basketball and helping to host some of the Tampa Bay Lightning pre and post game shows. Also heavy on Kalas agenda will be working with FSN Florida to do the Sunbelt Conference “Games of the Week” during the football and basketball seasons. 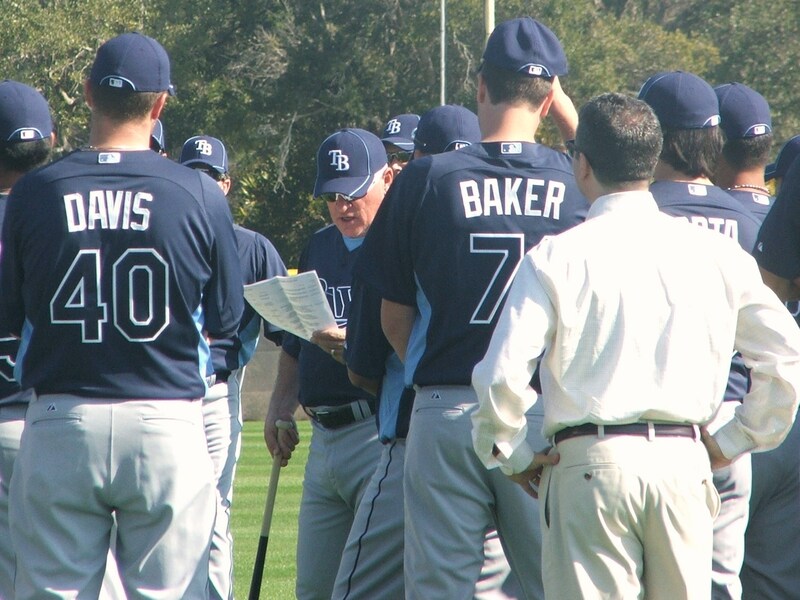 So as you can see, there will be plenty of great stories and awesome pictures to be passed around when the Rays report after the second Saturday in February 2010. But this year there will be no precursors of World Baseball Classic or even the usual smatterings of International games for players to have to report early this season to their teams. It might be one of the first years in the last several seasons that everyone on the Rays roster will come into the season with a vigor and vitality to again make some noise in the American League East. And maybe this off season is the time for the team to regroup and intensify their energies to again challenge for the top spot in the American League. And a few of you asked what I might be doing this off-season at the last game. Well, hopefully I will be going out to Seattle, Washington and completing the inside of my old retirement abode out on Whitbney Island near the city of Coupville that I originally started work on in 2007. Then after it is completed, let my cousins live in it until I am ready to “Go West old man” maybe in about 5 seasons. So hopefully you also have something exciting planned this off-season. Maybe a snow skiing trip, a quest to go back to school, or maybe even a jaunt down into the Carribean to watch baseball this Winter. Whatever it is, stay safe and remember, if you have a great adventure, this is the place to tell all of us about it……….I know I would love to read about it!